JAGUAR: Now owned by Tata of India, but still very much British, Jaguar has announced the new XJ sedan range due in car showrooms next January. The car looks like a nicely overgrown XF and comes with a whole collection of ‘toys‘. The XJ completes the new Jaguar range which started with the much underrated X series, the sweet handling 21st century XF and now a new contender for the smart car to have. Prices start from UKP52,000. PEUGEOT: The Peugeot 407 range is now available with a 1.6 HDI turbo diesel engine delivering 110 bhp and good for a claimed 110 bhp/129 g/km emissions. Fitted with Michelin low resistance Energy tyres, the car is claimed to return 57.6 mpg. Price is from UKP18,745. SEAT: A sporty Bocanegra 3-door version of the SEAT Ibiza will reach the UK market later this year. Developed at the SEAT factory at Martortell near Barcelona, the car features a lot of black and aluminium trim and is powered by a twin charged 1.4 TSI engine driving through a 7-speed selectable automatic DSG transmission. Bocanegra means black mouth in Spanish. TOYOTA: An all new Toyota Prius hybrid powered model is due for UK launch this August. The car will feature an optional solar powered air conditioning system to provide cabin cooling when parked. There will also be an air cooling system that can be operated from the key fob up to three minutes prior to starting the engine. VAUXHALL: Across the range, apart from Insignia, dealer fit front/rear parking sensors are now available. A simpler rear system fitted to the number plate is also offered for UKP179. Vauxhall’s new Insignia executive class model range has already gathered a lot of accolades, including European Car of the Year, and is much more of a serious contender than its Vectra predecessor in a market sector dominated by the likes of Volkswagen Passat, Ford Mondeo, Citroen C5, Skoda, Mercedes-Benz C Class, Peugeot 407 and many more. Initially, the Insignia was offered in four-door saloon and five-door hatch back forms, that has been highly rated by most testers though criticised by a number for sacrificing styling in the interests of rear space, notably headroom as a result of the rakish rear roof line. 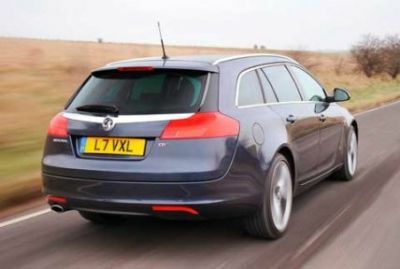 More recently the Insignia range has been expanded by the introduction of an estate version, Vauxhall use the more fashionable title of a Sports Tourer and it has developed a body shape which notably addresses the head space criticism of the original version as well as providing a moderate gain in load capacity. This body design also overcomes to a great degree the limited rear vision caused by the thick rear pillars on the hatch back Insignia. I have been driving the 158 bhp 2.0-litre turbo diesel version of the Sports Tourer in the near range-topping SE specification which includes satellite navigation which is an UKP800 addition on some of the other Insignia versions. This test car should probably prove the most popular in a range that includes both turbo charged and normally aspirated petrol units from .6 litres up to 2.0-litres, also an entry level 2.0-litre turbo charged diesel unit, developing 129 bhp. Other engine options are also planned. Transmission options include 6-speed units in both manual and automatic and the range also includes all-wheel drive versions powered by a potent 2.0-litre turbo petrol engine. Visually the Insignia is an imposing car, one of considerable substance though the creation of the Sports Tourer body has lost some of the racy looks of the saloon and hatch back derivatives in the quest for greater practicality. A styling problem shared with most estates in this market sector but not all. Open the tail-gate and there is a passable amount of easily accessible luggage space though of shallow height but with the bonus of split folding rear seats (taking available capacity up from 540 up to 1,510 litres), a central ski hatch and substantial chrome finished load securing lugs. Bright metal strips are embedded into the roof to accept a roof rack or roof bars if required. What was obvious from the moment I sat inside the Insignia was that the build quality, most of the finish, equipment specification, driving comfort and fascia presentation was very close to the style and standards currently exhibited in the mainstream quality German cars. For me, the only let down was the use of imitation wood trim. I suggest either fit the real thing or use the currently in vogue polycarbonate. The only leather items on this SE version were the covering on the steering wheel and gear knob. From the outset the Insignia drives like a quality class car with much more dynamic handling and response than the Vectra and even though it is similar in size to the Mondeo it felt smaller to drive and easier to place both on the road especially when setting up for fast corners and also when accessing into that last remaining parking slot. Controls are responsive though one has to take a moment to understand and then appreciate the electronic parking brake. Instrumentation is clear and conventional, the satellite navigation system user friendly though the central switch panel is a bit busy looking until fully comprehended. Comfort levels in all five seats are to a high standard, though the driving seat is a mix of manual and powered adjustment. There is plenty for the discerning driver to appreciate, the road grip is impressive, the steering response accurate and the braking power strong yet smooth. The power unit, not the quietest diesel I have recently experienced, delivers a good spread of power and is complemented by the clean changing manual gearbox. With good flexibility this engine enables smooth and rapid acceleration with 60 mph claimed to be achieved in 9.3 seconds and with a top speed of 132 mph. Expect to get around the 40 mpg mark which is impressive for a car of this size/weight. Apart from a sun roof this car has about everything you would expect to find in an executive class car, notably an easy use satellite navigation system, front, side and curtain airbags, front active head restraints, Electronic Stability Programme, cruise control, automatic lighting and electrically adjustable/heated exterior mirrors. Front/rear parking sensors are an option at UKP365. In this class this is undoubtedly the best Vauxhall yet, providing notable driving dynamics with easy character, impressive product quality and in Sports Tourer form a bit more practicality that will be appreciated whatever the car’s use. Yet another example of Vauxhall’s modern and very competitive car range.